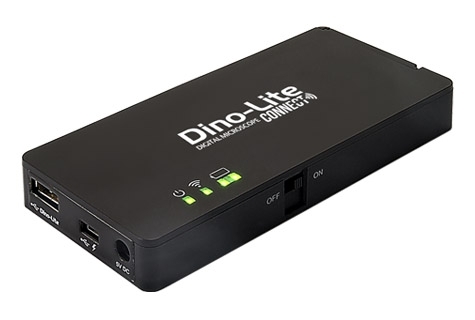 The WF-10 Dino-Lite CONNECT is a Wi-Fi streamer designed for displaying Dino-Lite’s live image on a mobile device such as iPhone, iPad, Android phone, or Android tablet. By connecting the Dino-Lite to the USB port, the WF-10 could transmit high quality live images smoothly through Wi-Fi to the connected mobile devices. The WF-10 can be powered by the power adapter for stationary use and the battery will be charged simultaneously for the next mission. Note: The WF-10 is compatible with certain models of Dino-Lite. Please consult your local reseller for further information.